Bohemian Rhapsody is a foot-stomping celebration of Queen, their music and their extraordinary lead singer Freddie Mercury. Freddie defied stereotypes and shattered convention to become one of the most beloved entertainers on the planet. After an unexpected turn, Freddie shuns Queen in pursuit of his solo career. Having suffered greatly without the collaboration of Queen, Freddie manages to reunite with his bandmates just in time for Live Aid. Click here to see a trailer for Bohemian Rhapsody. It doesn’t matter if you are a Queen fan or not, this movie is a must see for any music or movie lover. 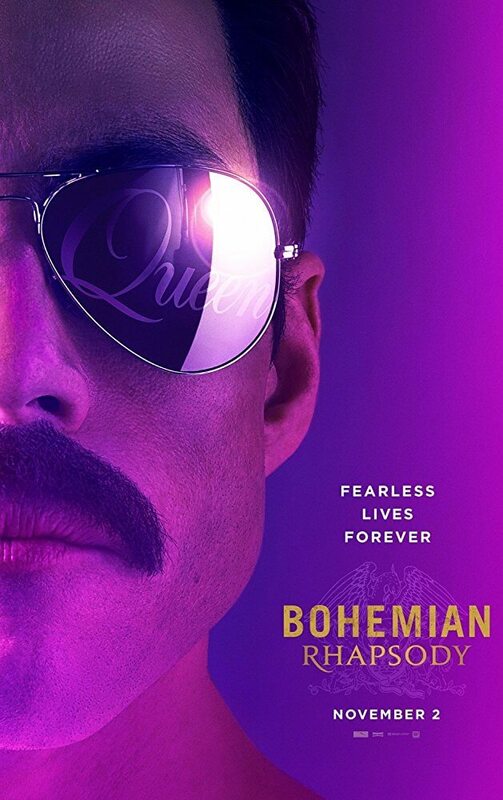 Anyone who sees this film will go through a roller coaster of emotions from either Queen’s music and the personal memories that come with, or the story behind the music. 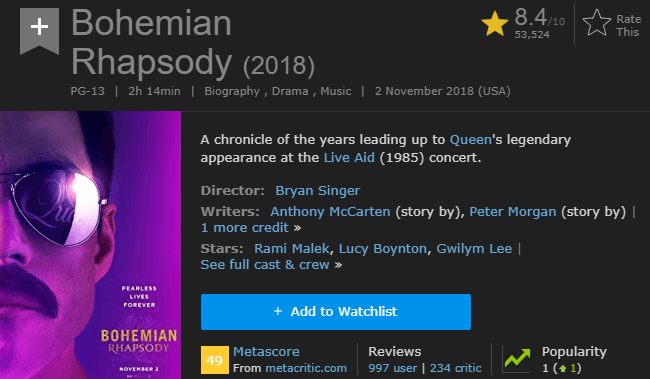 53,524 IMDb users have given Bohemian Rhapsody a weighted average vote of 8.4 / 10 stars. Users say while this movie might not be a masterpiece, it fills your heart with such happiness and joy! Freddie Mercury, Brian May, Roger Taylor, and John Deacon are so exquisitely portrayed that you might forget it isn’t them. Overall users agree this film is one of the best movies of the year. Critics on Rotten Tomatoes rated Bohemian Rhapsody at a 60% on the Tomatometer. Critics said they would have liked the film to add to or to contextualize the legacy of Freddy Mercury and Queen. Instead, Bohemian Rhapsody is more of a dramatized Wikipedia entry, watered down and over-edited. With that said, critics are impressed by Malek and the magnificent job he did recreating Freddy Mercury’s moves onstage. Read more on Rotten Tomatoes. Critics on Metacritic rated Bohemian at a 49 on the Metascore board. This mixed Metascore is based on 13 positive reviews, 23 mixed reviews, and 9 negative reviews. Critics who enjoyed this film said Bohemian Rhapsody captures an era, a man, and the universal quest for identity. Other critics say the film is a muddled and overlong experience that too quickly becomes forgettable. Young American dancer arrives in 1970s Berlin to audition for the world-renowned Helena Markos Dance Co. When she vaults to the role of lead dancer, the woman she replaces breaks down and accuses the company’s female directors of witchcraft. Meanwhile, an inquisitive psychotherapist and a member of the troupe uncover dark and sinister secrets as they probe the depths of the studio’s hidden underground chambers. Click here to see a trailer for Suspiria. A fair warning to all: You will cringe, you will dismay, and you will awe during your viewing of this bloodful glorification of cinematic virtuosity. Guaranteed. Luca Guadagnino’s Suspiria follows the same core plot trajectory as the original film as it details an American dancer who finds herself in quite a situation at a German dance academy run by witches. But unlike the original Argento film, Guadagnino’s rendition of this story is an ambitious period piece underpinned by the political uproar of 1977 Germany. 3,865 IMDb users have given Suspiria a weighted average vote of 7.2 / 10 stars. Most users love this wild and wicked reimagined classic. Users say there is little not to like about Guadagnino’s Suspiria. While it does trip on its feet in a few areas, it is thoughtfully-imagined, vividly realized, and undoubtedly the most beautiful horror film this year. Critics on Rotten Tomatoes rated Suspiria at a 61% on the Tomatometer. Critics say this film is ambitious, grandiose, occasionally compelling, but far more often irritating and laughable. Unfortunately, critics say this reimagined Suspiria is more of a homage and a companion piece to the original. See more on Rotten Tomatoes. 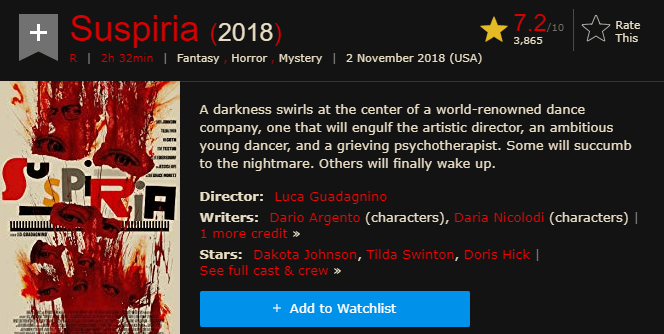 Critics on Metacritic rated Suspiria at a 64 on the Metascore board. This generally favorable Metascore is based on 32 positive reviews, 14 mixed reviews, and 7 negative reviews. Critics call Suspiria many things including gorgeous, hideous, and an uncompromising film. 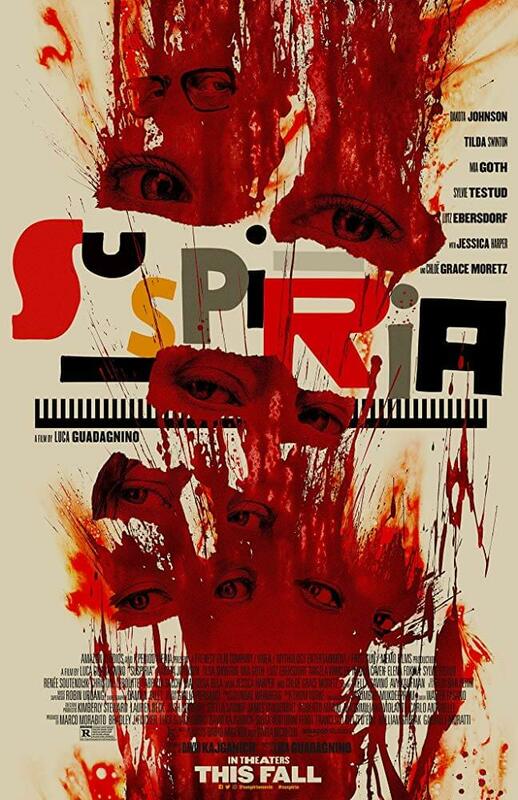 Critics appreciate how director Guadagnino laid such an artful foundation at the beginning of this film that by the time you finally get to the blood and guts, the viscera is just another part of Suspiria’s hypnotic modern dance. Young Clara needs a magical, one-of-a-kind key to unlock a box that contains a priceless gift. A golden thread leads her to the coveted key, but it soon disappears into a strange and mysterious parallel world. In that world, she meets a soldier named Phillip, a group of mice and the regents who preside over three realms. Clara and Phillip must now enter the fourth realm to retrieve the key and restore harmony to the unstable land. 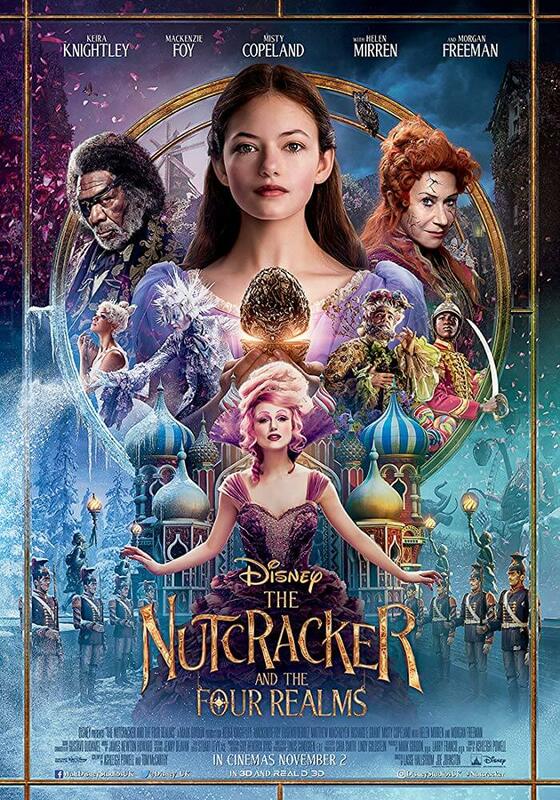 Click here to see a trailer for The Nutcracker and the Four Realms. The Nutcracker and the Four Realms is a movie you should definitely see on the big screen in order to fully appreciate its special effects. This Disney production will likely enchant the hearts of your little girls and boys while also tugging at the heartstrings of grown-ups who still value all that was given to them by their departed parents. 3,555 IMDb users have given The Nutcracker and the Four Realms a weighted average vote of 5.5 / 10 stars. Users were very disappointed in this film. They said the plot was all over the place, the acting was mediocre, and it was too different from the original story. The film attempts to upend your expectations of the story, but each and every revelation or twist falls completely flat. Critics on Rotten Tomatoes rated The Nutcracker and the Four Realms at a 34% on the Tomatometer. Critics compare The Nutcracker and the Four Realms to A Wrinkle in Time calling them both an expensive but clunky fantasy, mashing together mythical elements but mostly hitting discordant notes. Unfortunately, the enchantment is absent in this film. 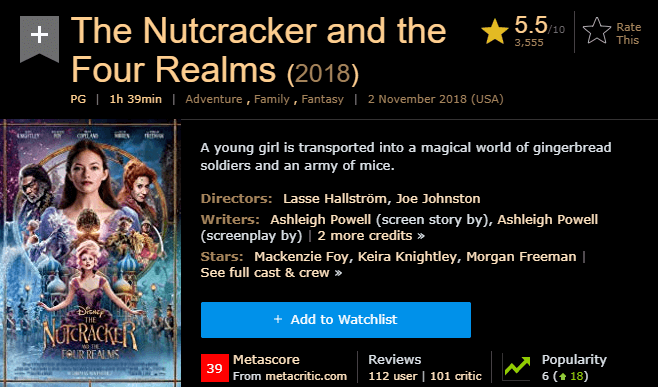 Critics on Metacritic rated The Nutcracker and the Four Realms at a 39 on the Metascore board. This unfavorable Metascore is based on 4 positive reviews, 19 mixed reviews, and 13 negative reviews. Critics say that the fans of fancy period costumes and supernatural effects with CGI will get plenty to gawk at, but the story offers no real surprises or big plot twist. The Grinch and his loyal dog, Max, live a solitary existence inside a cave on Mount Crumpet. The Grinch’s aggravation comes from Christmastime and his neighbors in Whoville who always celebrate the holidays with a bang. When the Whos decide to make Christmas bigger and brighter, the disgruntled Grinch realizes there is one way to gain peace and quiet… Steal Christmas. Gary Hart, former senator of Colorado, becomes the front-runner for the Democratic presidential nomination in 1987. Hart’s intelligence, charisma, and idealism makes him popular with young voters, leaving him with a seemingly clear path to the White House. All that comes crashing down when allegations of an extramarital affair surface in the media, forcing the candidate to address a scandal that threatens to derail his campaign and personal life. In an effort to thwart Grindelwald’s plans of raising pure-blood wizards to rule over all non-magical beings, Albus Dumbledore enlists his former student Newt Scamander, who agrees to help, unaware of the dangers that lie ahead. Lines are drawn as love and loyalty are tested, even among the truest friends and family, in an increasingly divided world. Enter your name and email address below to get updates on our POG BLOG.